Rocky coves, towering cliffs and glorious beaches, many with the coveted Seaside and/or Blue Flag awards. Marvellous resorts or tiny fishing ports. Non-stop family fun or windswept, waveswept solitude. That’s the choice on the Yorkshire Coast. A rugged coastline with a backdrop of the North York Moors National Park is the setting for the Yorkshire Coast’s resorts and fishing villages. This is a coastline of high cliffs and rocky shores, rich in flowers and wildlife. Follow the cliff top path for over 30 miles along the North Yorkshire Heritage Coast or visit one of the coastal resorts or villages. For bustling and buzzing atmosphere, try Scarborough, a major resort packed with action and catering for the whole family. Between the safe, sandy beaches of the North and South Bays is the harbour where the fishing boats still land their catch, overlooked by Scarborough’s medieval castle. Traditional seaside attractions and a busy shopping centre add to Scarborough’s appeal. Its parks and gardens help attract conferences and events to its Spa complex. The picturesque fishing port of Whitby is little changed since the days of its famous son, Captain Cook. The eerie drama of clifftop Whitby Abbey inspired the writing of ‘Dracula’. Stroll through Whitby’s quaint cobbled streets past picturesque houses overlooking the River Esk or inspect jewellery made from Whitby Jet, a dark black fossil mineral found here. North of Whitby is Staithes, a quaint little fishing village at the bottom of a steep ravine. Steps and narrow alleyways wind through picturesque Robin Hood’s Bay down to the slipway at the bottom of a steep ravine. For over 500 years fishing boats have been based here, with whole families working on some part of the baiting, catching, and salting process in the heyday of the fishing industry. At low tide rocks dating back to the Jurassic period are exposed, and fossils are regularly found. The local museum and the new visitor centre have examples. The small resort of Filey has been a family favourite since Edwardian times. This unspoilt town, with five miles of golden beach in the lee of Filey Brigg headland, has an interesting range of shops and a Folk Museum well worth a visit. Filey’s Edwardian Festival in June recreates the flavour of the period. 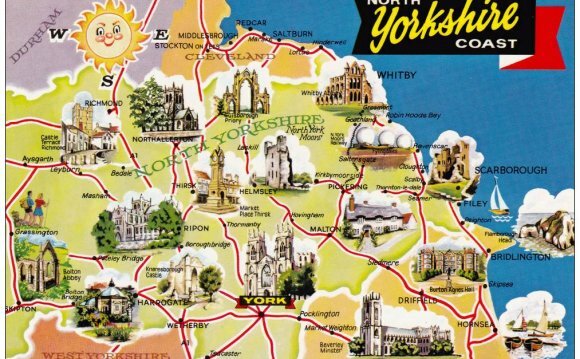 Picturesque country towns, historic houses, and the superb landscapes of the North York Moors and Yorkshire Wolds are within easy touring distance of the coast. RSPB Bempton Cliffs offers viewpoints and nature trails for watching rich birdlife, including puffins and migrating birds. Bridlington lies on Yorkshire's east coast just south of the dramatic chalk cliffs of Flamborough Head. Bridlington boasts wonderful beaches, two 18 hole golf courses, a colourful harbour and pleasant promenades. Classic sporting events include Filey Fishing Festival, Scarborough Cricket Festival and Motorcycle racing at Scarborough’s Oliver’s Mount. For gentler pursuits the Cleveland Way National Trail offers spectacular walks along the clifftops.